Thea Culver stretched and climbed out of bed. “No more musing,” she told herself sternly. “Time to get to work.” The sun was just peeking into her bedroom window over the tops of the mountains and through the huge Sitka spruces in her yard. She knew that meant it would soon be streaming into her studio upstairs. But first she got to enjoy it through the shower window. As she ducked her closely cropped crinkly hair in the gloriously hot stream of water, she thought about all that she was washing away in her life these days. Gone were the ambitions to be a successful “capital A” Artist…. well, almost gone. The “capital C” Call of her recent move to the coast had been a compelling one. She had come despite the warnings that by going so far from the mainstream both geographically and content-wise, she was throwing her hard earned reputation away. She hated to think how many had cautioned that her galleries in Portland and Seattle would not be interested in this new weird bent she was on. Gone too was her primary identification with her black community. “It’s mostly alotta white folk out there,” was the gist of the comments from her friends. Her family understood that part of it – much of her mother’s side was Greek and she had grown up in Beaverton. That Portland suburb had a little racial variety but nothing like she had found going to art school in the East or what she had consciously chosen upon returning to Portland twenty years ago. But even her family thought she was headed dangerously over a cliff into woo woo land. How could she explain this strong sense that she needed to explore this deeper side of herself away from familiar territory. The Call had definitely created a fork in the road. Though terrified, she had nevertheless decided to “take the road less traveled.” How that would show up in her life was still unknown. There was a lot of blank canvas between her and any sort of clear outcome. She thought of the tarot cards in her basket. The Hanged One – a figure dangling upside down from a tree branch – had been coming up a lot lately in her readings for herself. It was a symbol of changes chosen freely, unlike the Tower that was a painful lightening bolt wakeup zap. One of her books referred to the Hanged One as the Norse God Odin who had friends lower him by his heels into a well where he uncovered the runes. The card was also about a sacrificing of success and power for a communion with the earth. A surrender of the sort that is neither a giving up nor a defeat. She was choosing to take the continuing appearance of this card as a sign that she was on the right path. Sometimes it felt that she had hung herself that drastically as well. It was one thing to paint the watercolor urban landscapes she was known for and which sold well. It was quite another to dive deep into her psyche and pull up images of bleeding vaginas and strangely morphing shamanic power animals, not to mention the change in her palette that made many uncomfortable. It was no wonder she had been so drawn to the tarot when she first encountered it a few years ago just as her monthly bleeding was coming to a halt around her 50th birthday. It was like the Fates or whoever had given her a gift for the next phase of her life. Looking back, it was clear that it was a gift that had changed everything. She would never forget the Chariot of the MotherPeace deck – the first card she had drawn. There had been that shiver of delight as she recognized the apple tree, Athena with snakey haired Medusa on her shield and Nut, the Egyptian Sky Goddess, arching over. So many symbols she had grown up loving…. As her new friends here reminded her if they heard her fretting, a shift as big as hers was bound to take a while to get started, much less to gel. “To change gears, you have to go through neutral,” both Ursula and Owen had said more than once. It seemed everyone here was wiser than she was. Yet she had to give herself credit for listening to the Call in the first place – especially with all she had given up of her former life including lover, nice home and her comfy reputation. “Too comfy. Sometimes a snake has to shed her skin,” she snorted as she put on the bespattered sweats that were her painting outfit in colder weather. “Brr,” she thought now. Fall was definitely here. Her studio was indeed inviting, if chilly. The little electric heaters were whirring and would soon warm it, as would the sun. It lit up the paintings on the walls and the cutouts pinned all over like a collage gone wild. Some were pretty strange to her and she hadn’t yet figured out why she was drawn to put them up. Looking at the Georgia O’Keefe pelvis print always gave her a shiver as did an older painting of Indians sitting around a campfire, most with their backs to her, their faces lit by the fire. “Should I be thinking of them as Native Americans?” she wondered a little guiltily. And then there were her own paintings. At first it had been a matter of blind faith to launch into the new mediums of acrylics and oils, avoided since her college days. Now she delighted in the immediacy of one and the smear-ability of the other. Both gave freedom from the carefulness that had kept her previous work pretty tight. She’d avoided putting figures in her other work, but thanks to life drawing classes many years ago, women’s bodies still flowed out of her hands. She wished she’d had more male models back then. But the Chagall postcards she had pinned up with their rough characterizations and dreamlike quality gave her license to push those boundaries in her own work. 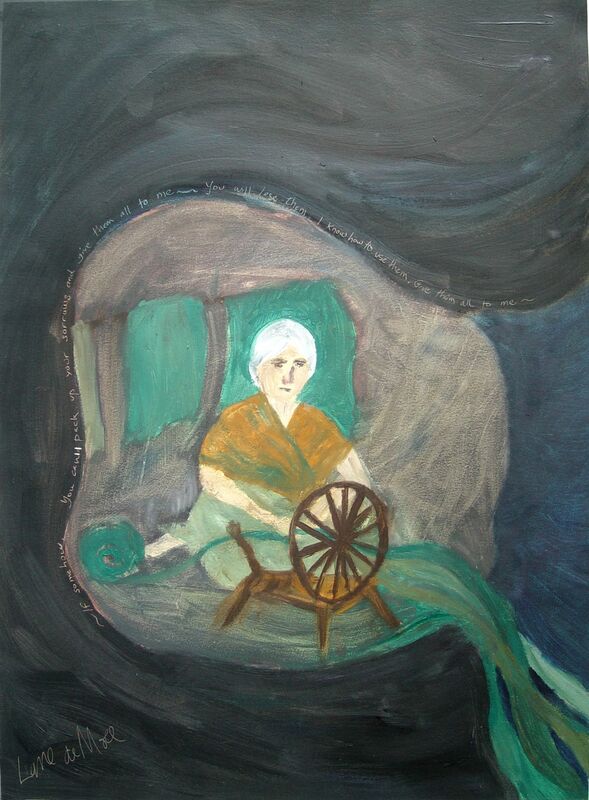 Now this new one of an old woman at a spinning wheel…. She kept having the feeling that the woman was under the Mountain somehow or in it. Spinning seaweed? Spinning stories? Thea wondered if there were any native legends about a woman in this Mountain she now lived at the toe of. What colors would she be wanting on her palette today? Was it a green day or a purples and reds day? Would that weird combination of phthalo green and white come out? It seemed more and more to indicate some wild, uncontrolled magic in the paintings, often showing up when the Pan-like figure did. Should she smoke a little weed to get herself going? That was a new practice for her too. She had somehow missed most of the drug-laden times of her growing up era, but had recently been drawn to some locally grown that added a deepening to her process. She didn’t smoke every time she painted but some days it was a potent tool. A sacred one that added a sacred dimension to her work. Blessings on California for instigating the conversation about making marijuana legal. Thea found her pipe and stash tucked where she had left it by the paint rags. She looked over to the corner where a Frieda Kahlo print was propped. She’d found it the other day at the recycling center. Frieda, practically a goddess herself, inspired Thea to be bold and fearless as she delved deep. It had been Frieda’s karma to undergo some serious Tower episodes to reach into herself, portraying her tortured world unflinchingly. Thea was determined that her own healing and search would be more like the Hanged One – no need to have a bus accident to take up the journey she was meant to be part of. She was about to tackle the cobwebs around her growing collection of feathers, shells and dried flotsam, when she thought of Grandmother Spider, whose season it was. A huge spider had recently taken up residence over her kitchen sink and amazing webs were all over the yard. As a city girl she ought to have been afraid of spiders, but she never had the heart to kill them, though she did usually try to keep their webs at least slightly under control. Today, however, she suddenly made the connection between spiders and Halloween, the witchy time just around the corner. She was learning that they are an inevitable fact of life here in the woods and perhaps she should be honoring them by letting even their webs stay a bit longer. Perhaps that was why cobwebs were a part of Halloween decorations. This time of year it was simply too overwhelming to keep them cleaned out. The unfinished green painting of the old woman caught her eye again. Is she spinning just like Spider does? Does the silver thread come out of her midsection like that of the Southwest Indian creator goddess? What needed to happen to that painting so that it expressed both The Mountain and the storyteller and Spider? And give them all to me. I know how to use them. Then selecting B-Tribe on her iPod, Thea settled in to discover what else the painting wanted and what Grandmother Spider had to teach this willing student.